Of all the 19th century Fitzrovians who had secret families, Wilkie Collins is probably my favourite. Famous for ‘sensation novels’ such as The Woman in White and The Moonstone, Collins was adept at probing the hypocrisy that underpinned bourgeois family values in Victorian England. Like the main character in The Woman in White, he was fascinated by the ‘idea of something hidden below the surface’. Marian (Jessie Buckley), Walter (Ben Hardy), Laura (Olivia Vinall) in the BBC drama of Wilkie Collins’ The Woman in White. Image: BBC Media Centre. Unorthodox relationships, confused identities, and the economic plight of women were the staple fare of his work. Unconventionality was something that Collins embraced in his personal as well as his professional life. Unlike his close friend and collaborator Charles Dickens, he never attempted to wrap a veil of respectability around his affairs. As a result his families were never particularly secret, though he was certainly anxious that his much-loved mother should never find out about them. He was implacably opposed to the notion of marrying. In an article called ‘Bold Words by a Bachelor’, written for Dickens’ weekly magazine Household Words, Collins argued that ‘the general idea of the scope and purpose of the institution of marriage is a miserably narrow one’. But this was probably hard on the women in his life, whose social existence was much more circumscribed than that of a bohemian male writer. ‘Smeary Street’ was his own name for the thoroughfare. ‘I have witnessed some sad sights during my stay in Smeary Street, which have taught me to feel for my poor and forlorn fellow-creatures as I do not think I ever felt for them before …’ (Household Words 14 June 1856). Sadly if Collins were to walk down Howland Street today he probably wouldn’t consider it greatly improved. In 1858 he set up home with Caroline at 2a New Cavendish Street, and it was here that he began his novel The Woman in White. Later the couple moved to Harley Street, then to Dorset Square, and finally in 1867 to Gloucester Place. Collins’ tandem family was acquired in 1868, soon after the death of his mother, when at the age of 44 he embarked on an affair with 20-year-old Martha Rudd. Martha may have been one of his mother’s servants. Before long she was settled in lodgings at 33 Bolsover Street under the name of Mrs Dawson, and she went on to bear Collins three infant ‘Dawsons’, two girls and a boy. They were to remain a couple to the end of Collins’ life. ‘My morganatic family’ was how he referred to them, and when dealing with the landlady he called himself Mr. William Dawson. So like some of the characters in his own novels, Collins was taking on a double identity. Understandably Caroline was not too enthusiastic about Martha’s appearance on the scene. At some point in 1868 she moved out of Gloucester Place, and in October that year she married a young man called Joseph Clow at Marylebone Parish Church. It may have been an amicable arrangement — Collins attended the wedding, and he continued to care for Caroline’s daughter Carrie until she herself married. But Caroline’s own marriage was not a success. In 1871 she left her husband and returned to live in Gloucester Place, becoming Collins’ housekeeper and almost constant companion. Gradually the writer settled back into a dual domestic existence. Sometimes he took both families on holiday to Ramsgate, with the Caroline branch augmented after a while by Carrie and her three young daughters. The two households were installed in neighbouring boarding houses, and the children all played together happily. But Caroline and Martha never met. When Collins died in 1889 it was Caroline who headed the group of mourners at Kensal Green cemetery. ‘Mrs. Dawson and family’ had to be content with sending a cross of white chrysanthemums. Collins had divided his estate equally between Caroline and Carrie, and Martha and her children. On her death in 1895 Caroline was buried in the same grave as the writer. The plot was tended by Martha until her own death in 1919. 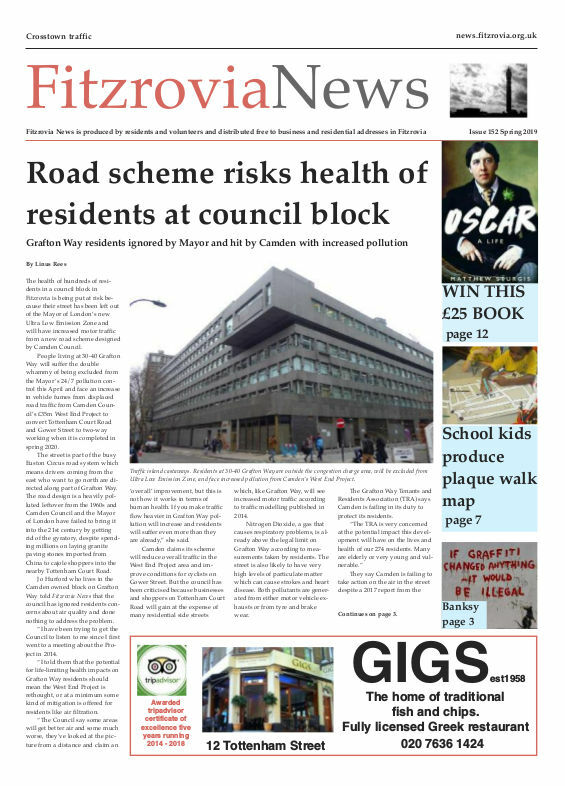 This article was originally published in the printed edition of Fitzrovia News FN129 June 2013. The Woman in White, a five-part BBC drama of Wilkie Collins’ psychological thriller, written by Fiona Seres, directed by Carl Tibbetts, produced by Origin Pictures, is available to watch on iPlayer.